My husband recently pointed out an article in The Wall Street Journal on the popularity of patterned pencil skirts for spring. Although I think the look is great, I tend to avoid patterns—particularly when they’re wrapped around my bottom half. And then I found this at Maiden Lane in Nevada City, CA. 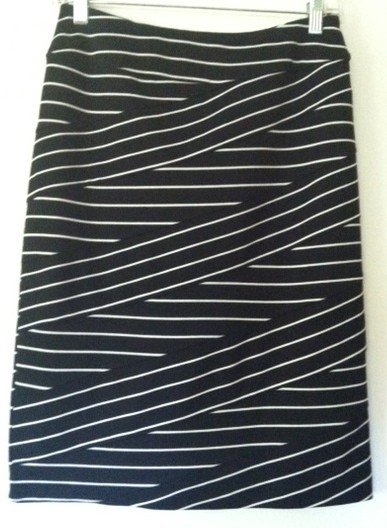 Made by Tribal, it’s one of the most figure-flattering skirts I’ve ever worn. It’s the absolute exception to the avoid-horizontal-stripes-at-all-costs rule, because the varied directions of the stripes on the front detract from any illusion of width. (And for some bizarre reason that I have yet to figure out, even the horizontal stripes on the back defy that rule.) It’s fully lined and made of a substantial jersey-type fabric with a hint of spandex, so it follows your body’s contours without clinging to hips or thighs. I wear a lot of black, which always presents a problem in warm weather. No matter how lightweight the fabric, black looks hot. 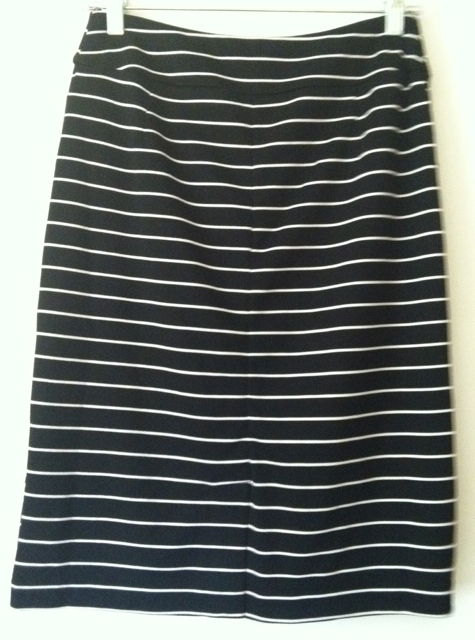 But the bright white stripes in this skirt visually lighten it so it looks a bit more spring/summery than solid black. To me, this skirt is an optical illusion on a lot of levels. I may not be able to explain any of it, but I love it all. Available at Maiden Lane, 307 Broad Street, Nevada City, CA — 530.265.9520. Just as types of clothing and fabrics come in and out of vogue–think this season’s trend toward dresses and Bermuda shorts…bold stripes, flirty florals, and ultra-feminine lace–so do colors. 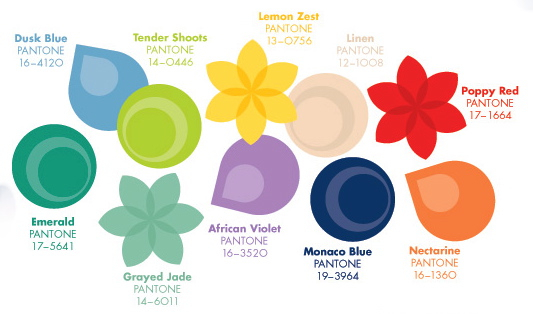 According to the Pantone Color Institute, these ten colors are the latest and greatest for spring and summer. What I love is the brightness of the palette and the fact that we’re not being inundated with the usual warm-weather-driven pastels. 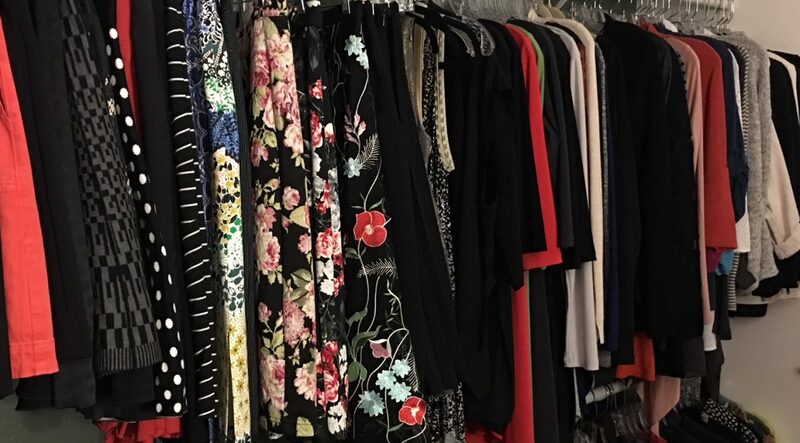 I tend to go through seasonal shock this time of year when I realize that my black, grey, and more black fall/winter wardrobe will not cut it when temperatures rise. Shock turns to dread with the knowledge that pink, baby blue, pale yellow, and lavender make me look ill. But these colors have universal appeal, offering shades that will resonate for all skin types. Thank you, Pantone people. You’ve done us a great service.